Proper technique will help you sink those putts. 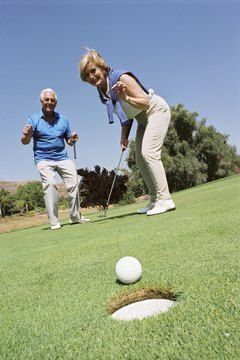 The average golfer takes more strokes on the green than anywhere else on the course. He also spends his practice and warm-up time on the range beating balls. Rarely does he set foot on the practice green. If you are new to the game, set aside significant practice time to focus on putting. The putting stroke is simple and can be grooved in a few sessions. Stand with your feet shoulder-width apart. Your toes, knees, hips and shoulders should be on the same vertical plane. Keeping your back straight, bend slightly at the waist until your eyes are directly over the golf ball. Let your arms hang loosely. Grip your putter where your hands naturally clasp together. Grip the putter firmly. Keep your hands, wrists, arms and head still. Make a stroke by rocking your shoulders like the pendulum on a grandfather clock, straight back and straight through. It should be a smooth, rhythmic motion. How Do I Become a Better Putter?